Ladies and gentlemen, it's here. Election night. Hopefully you voted. Hopefully your ballot is being counted. 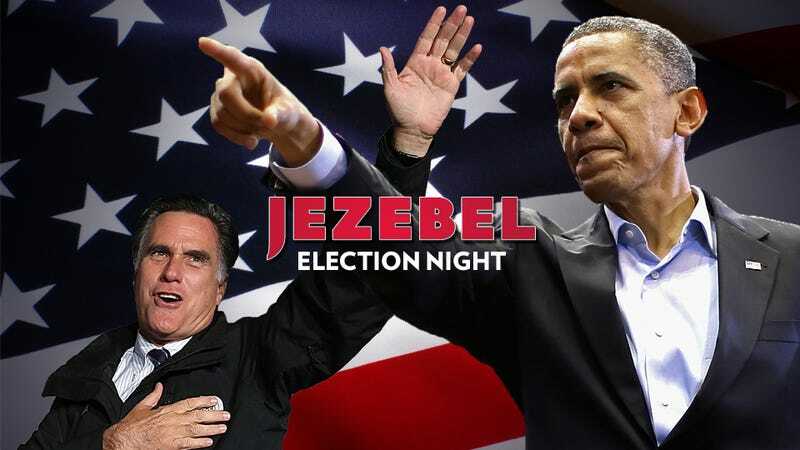 And hopefully, tonight, we'll knew who won the 2012 Presidential Election. Is your head spinning? Are you in a daze? I'm quivering with anxiety and just five minutes ago typed "erection night" accidentally. I'm hoping my ballot actually got scanned (I didn't see it go into the machine with my own eyes) and I'm worried somewhat that my favorite astrologer Susan Miller is predicting that there may be unexpected results: maybe someone will win the popular vote, and someone else will win the electoral college? (Mercury went retrograde today at 7pm.) But! Nate Silver crunched the numbers and as of right now, he claims there's a 90% chance that Obama will win. Meanwhile, we're monitoring Twitter (which might crash), blogs, TV networks and phone calls from Mom to bring you the very latest in election night news. Keep checking back, and also let us know how you're spending election night: Are you drinking? Are you watching TV? What channel are you watching? Are you scared? Excited? Exhausted??? I'll be updating and adding news below. DONE DEAL GUYS. Thanks for hanging out! NBC is calling it. Barack Obama has been reelected. In case you missed it: Mike Huckabee thinks Republicans have done a pathetic job of reaching out to people of color. ORLY? Meanwhile: Obama is projected to win new Mexico, which would put him at 249 electoral votes. CNN is projecting Obama will take California, Washington and Hawaii. And Wisconsin. Romney is projected to win North Carolina. My dog decided I was spending too much time with the laptop and has commandeered my lap. He is watching CNN and yawning. I'm tired. There has to be a better way to do this. I feel like I'm waiting for Santa Claus, or for the New Year's Eve ball to drop. Except so many maps and so much talking. Not enough party. Here's what the TV sounds like right now: Florida Florida Florida Florida Florida Florida Florida Florida Florida Florida Florida Florida. James Carville uttered the word Florida about seven times in 30 seconds. Elspeth Reeve at The Atlantic Wire has put together a gallery of The Sad Faces of Fox News on Election Night! Almost all of Mr. Romney's advantage can be explained by one county, Wake County, in North Carolina's Research Triangle. President Obama won it by 64,000 votes in 2008. This year, Mr. Romney leads by 2,000 votes so far. CNN projecting that Obama wins New Hampshire. Like many of us, Martha Stewart has turned to food. BIG NEWS! Warren. Baldwin! Pennsylvania! Text from coworker Madeleine: "I am eating whiskey." Text from friend in California: "I especially want Obama to win in every state where Republicans made efforts to keep poor, minority people from voting." Friends, I'm calling it: SNACK TIME! Guys, I am worried about Nate Silver! Wolf Blitzer is YELLING about how Romney is winning by a mere 636 votes in Florida. It's CLOSE, he is saying. Yes, Wolf. We can see that. Is it possible to pour this can of Coca-Cola directly into my veins? Or aorta? Friend on Facebook writes, "I will voMITT." BTW did you see what Bill O'Reilly has been up to tonight? Basically, poor people want stuff, and Obama will give it to them. Not sure what kind of "stuff" he means, maybe freedom of choice? Equal rights? That kind of stuff? FLORIDA AT 50/50. Raise your hand if you have a stomach ache. What are reverse coattails? I am picturing a McQueen jacket. Obama projected to win Michigan, New York, New Jersey. CNN showing Obama headquarters, where there is much cheering, some jumping up and down. Romney still ahead in terms of projected electoral votes. Romney projected to win Kansas, Louisiana, Nebraska, South Dakota, Texas, Wyoming, Mississippi. Remote control decided to stop working! Mutiny! The Politico map has 64-67 Obama-Romney. We're tracking the individual counties as they come in from that state, particularly those where there is a decent amount of Election Day votes reported, rather than just absentee ballots. Throughout the state, the vote tallies are coming in about exactly as you would expect in a tied race. Romney is projected to win Alabama. This means he could now have 82 electoral votes. EIGHTY TWO. Do you have your gynecologist on speed dial? Romney is projected to win Arkansas and Tennessee. This bumps him up, he now has more electoral votes than Obama. Romney has 73, the President has 64. Deep breaths, people. DEEP BREATHS. Just FYI I am putting on a sports bra and ordering Thai food. So far, however, Democrats also have an edge in the party identification numbers in the exit polls. In Ohio, 38 percent of voters identified as Democratic in the exit poll as compared with 31 percent of Republicans. And in Virginia, Democrats had a 37-to-33 advantage in party identification. These numbers are similar to what many pre-election polls showed. Mitt Romney is not necessarily poised to lose, however: he led President Obama among independents in both the Ohio and Virginia exit polls. It may be that some conservative-leaning voters are identifying as independent rather than Republican in the surveys, but still voting for Mr. Romney. Now Wolf says 64-56, Obama/Romney. I guess I will order some food. In the immortal words of Karen Carpenter, we've only just begun. Romney is ever so slightly ahead in the popular vote, but again, it's early. Now seems like a good time to make a double of whatever you are drinking, however. 64 to 40 at the moment. Obama is projected to win Connecticut, Delaware, Illinois, Maryland, Maine, Massachusetts, Rhode Island, DC. Massachusetts is Romney's state. Obama has the lead in Florida. But it's too early. Someone please read this story about unlawful voter purge in Pennsylvania. I can't. I can't with this! he's already shelled out $10,000 to 500 voters stranded by the storm ... in order to help them make it to the polls… The money was intended to help voters who were hit hard by last week's disaster to pay for gas or another form of transportation in order to cast their ballot. And get this — Game says he's so committed to the cause ... he even helped shuttle people to the polls in his own car. Paula Deen just tweeted about how awesome cast iron cookware is. Wolf Blitzer says Ohio and North Carolina are very very close. West Virginia: Romney, projected winner. Switching to CNN — NBC just gave me the weather. I know there's another storm coming but I need projection updates! Okay, CNN is projecting that Mitt Romney will win Kentucky, while President Obama will win Vermont. I have CNN on in the picture-in-picture. Maps and graphs and maps and graphs. Mind-numbing. Okay, for now I am watching NBC. The soothing brows of Brian Williams. The first closings! Virginia: Too close to call. BITE YOUR NAILS. Indiana: Romney. Kentucky: Romney. South Carolina: Too early to call. Vermont: Obama is the projected winner. Georgia: Too early to call. These are projections, obviously! Breaking news from Extra: President Obama likes Katy Perry's skintight "Forward" dress. Thank you, Extra, for the important update. Apparently Mitt Romney has not written a concession speech. He has, however, written a victory speech. Interesting. I'm so superstitious, I would think it was bad luck to write either one. Like buying baby furniture before the kid is born. Ooooh, Beyoncé is on Instagram, and put up a pic of herself wearing a "Texans for Obama" T-shirt. Good news, folks! An ayahuasca-guzzling shaman in the Andes mountains predicts Obama will taste victory tonight. Psychoactive homebrew for the win! Animal did a really cool lo-tech exit poll. On The Media made an interactive election night bingo! Click a square and your bingo chip appears. I want to thank you all again for the reception you gave me in August for my AMA. Good questions. Definitely not bad. I'm checking in because polls will start closing in this election in just a few hours, and I need you to vote.